The event brought together over a hundred people at the initiative of Partech Ventures and BPI France. It was an occasion to explore new marketing solutions and their uses, as well as innovative tools and strategic levers to digitalize a company’s marketing approach. 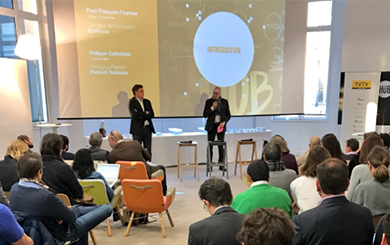 Paul-François Fournier, Director of Innovation for BPIFrance, introduced the event by highlighting the success of FrenchTech. An increasing number of startups are being funded. Venture capital funds have doubled in size, from €80 million between 2008 and 2012 up to €140 million between 2013 and 2015. Partech Ventures thoroughly embodies this strategy of developing large, powerful pan-European funds, with brands known both in the US and in China. But the group of "Frenchfab" companies is also important. These are French industry and service companies that generate a substantial amount of employment and develop industrial activity. The challenge lies in helping these companies undergo a transformation. Philippe Collombel, Co-Managing Partner of Partech Ventures, provided an overview of Martechs around the world. Investment in marketing tools was €800 million in 2008, and reached a peak in 2015 with €3.5 billion. This increase in investment led to a revolution in this type of tool. Fifteen years ago, marketing automation began at the end and proved to be fairly poor. It was the golden era of CRM. Once acquired, customers were managed by marketing. Marketing tools involved taking power from salespeople. They shifted power within the company, taking the address book from the salesperson in order to make the sales cycle more predictive. In recent years, tools have been created for all aspects of the field: consumer expectations, construction of a customer offering, pricing, customer life cycle management, and customer feedback. This abundance of tools, which came about due to venture capital investments, led to the development of multichannel, responding to a decrease in email opening rates and the predominance of smartphones. Consumers no longer tolerate being incorrectly targeted. Rebound rates are higher, and transformation rates lower. Many company directors feel lost. While there were initially very few tools, today there are a plethora to choose from that have to then be integrated into a solution that is tailored to the company's needs. This has led to a rediscovery of what exactly marketing is – a concept which, until recently, had been much simpler. With the marketing role being reduced due to marketing automation, online marketing in 2005-2006 was limited to the cost of customer acquisition. A first transformative revolution for marketers was the appearance of social networks. Customers could express themselves. In a changing context of consumerism where customers are now informed, very versatile, and able to give their opinion thanks to social networks and feedback loops, marketing has even more ways to address them. With the second revolution, the explosion of marketing tools, social networks forced marketing to evolve and to rediscover the concepts of positioning and branding. How do we address the client? What do I want to be on the market (instead of the simpler "what does it cost")? Customers are very informed. This phenomenon is particularly well-known in consumer electronics, where salespeople in the store are often less informed than customers, who get their information online. On top of that, the life cycles of products have greatly decreased, and this is an aspect that is continuously changing. This evolution has also extended to services such as banks with the explosion of Fintech, with clients able to access information online. Today, consumers visit up to 13 websites before making a purchasing decision. They express themselves – and for this reason, measurement tools are very important. Lastly, consumers are limited. With the shift in lifestyle, particularly in regards to working hours, consumers have less availability. This means reduced leisure time, along with less available time for consumption. People going away for a weekend do not spend their Saturday afternoon shopping. For traditional and middle-market companies, the challenge lies in finding a way to access the consumer in the time and place that he or she chooses. This is why multichannel is so important. Analyzing this revolution in marketing is essential for any company. - Product marketing, or the way in which marketing mechanisms are integrated into a product. While product packaging makes it possible to easily include marketing tools, the situation is more complex with software and services. Following these keynotes, the subject of the first panel was: Knowing your clients and defining targeted marketing through content production. It gathered on-stage Guillaume Decugis, CEO & Co-founder of Scoop.it!, Alix de Sagazan, Founder of AB Tasty, Maxime Favier, Founder of The Photo Academy and was moderated by Christophe Ginisty, Head of Digital Benelux at Ketchum. Guillaume Decugis pointed out that today, a client who walks into a store has already completed 70% of the online purchasing pathway. Marketers need to be professors: they should explain, educate and inspire. Content has to be personalized. It should not be product-centric or brand-centric, but rather customer-centric. The method involves listing the various questions that the different profiles of potential clients might have, thereby being able to answer the questions "Who am I selling to?” and “Who are the decision makers?”. Pauline Boisseau, Head of Sales, Central & Southern Europe, at TVTY, was the next presenter on-stage. She talked about reinventing media plans for the digital age using moment marketing. We are exposed to 500 to 700 advertising messages per day. The real challenge is to successfully maximize the impact of communication. Eighty-three percent of CMOs find that it is extremely difficult to reach consumers with a pertinent message. In the equation of right message + right timing + right audience, the right audience is now mostly managed through media planning and big data, and the right message comes from dynamic creation tools. But communicating at the right time is complex. However, if the message is contextualized and adapted to the right timing, pertinence and impact increase. A moment on television has a strong influence on the consumer. More than half of consumers use their smartphones to look for products. Online sales increase when temperatures go above 77°F. Pirelli noticed an increase in sales when the team that it supplies won a Formula One Grand Prix one weekend. A traditional media plan leads to missed opportunities and ineffective spending (spending with no impact for the brand). 1/ Integrate the concept. The budget which is to be allocated to moment marketing needs to be defined, even if this budget ends up not being spent if the anticipated moments don't happen. 2/ Contextualize and align the communications strategy with the moment. The next panel was about “Securing customer loyalty by building communities” and gathered Nicolas Hammer, CEO & Co-founder of Critizr, Bertrand Saint-Martin, Vice President France at Brandwatch and was moderated by Benjamin Bouygues, Head of Startup Acceleration Programs at Bpifrance. User communities are dynamic tools for brands and products. Analyzing a community can show more detail about the various personas. For example, Bertrand Saint-Martin, Vice President France of Brandwatch, explained how the characteristics of whiskey drinkers differ – between those using whiskey to get drunk, and those who appreciate better products or women (40% SOV). But as Critizr shows, building, structuring and facilitating a community can also be a good method for channeling, handling and salvaging dissatisfied customers, as well as for creating traffic and additional revenue by relying on clients and prospects that become ambassadors for the company. According to Brandwatch, one success factor for working with communities is not being afraid of being wrong. For example, Unilever thought that more Ben & Jerry's ice cream was eaten in the summer. But in reality, discussion is stronger in the winter, with people eating Ben & Jerry's in movie theaters. For Critizr, a second success factor is to have employees listen to what the community is saying. The best stories can be highlighted, and credit given to the employees that are the most active and effective in this process. The ROI of this listening and channeling is quick (less than 6 months). The last keynote featured David Bessis, CEO & Founder of Tinyclues who talked about “Artificial Intelligence revolutionizing marketing”. He explained how CRM teams could not increase the pressure in messages for fear of chasing away customers. They would, however, like to further personalize messages – which isn't always easy, as the messages in the databases are sometimes quite old. Today, about 1% of clients visit a company's website. This 1% is the subject of a major battle, with trigger marketing, retargeting, etc. But what do we do about the other 99%, those that aren't website visitors? Currently, they are being spammed. They receive redundant, poorly-targeted messages. The challenge is to give them new information via the traditional marketing model. For a new iPhone, it is possible to target Samsung consumers by looking in the relevant databases. It is not about making an attempt at arbitrary sociology based on intuition, but rather applying algorithms. In France, physical retail accounts for $463 billion, compared to $60 billion online. In-store revenue represents 92% of the turnover, with an average of 8% made online (2% to 20%). Most data is acquired in store and via the loyalty program. The first challenge is to obtain all of the data instead of just part of it. Using Ysance, Auchan's DMP collects all of the data: receipts, use of Auchan Drive, visits to auchan.fr, and behavioral data on all websites through a single system. These data can then be used for targeting via emailing, Facebook/Google environments or websites, thereby bringing together the various ecosystems. When an email is sent to a customer, it is possible to provide new, personalized information or a promotion on the website. Personalization tests show that this approach generates an additional 3% of sales revenue. The event went on with time for networking among attendees and an Innovation Showroom to meet all speakers and more MarTech companies such as Gigya or Pricing Assistant.